Messier 86 (also known as M86 or NGC 4406) is an elliptical or lenticular galaxy in the constellation Virgo. It was discovered by Charles Messier in 1781. M86 lies in the heart of the Virgo Cluster of galaxies and forms a most conspicuous group with another giant, Lenticular Galaxy M84. It displays the highest blue shift of all Messier objects, as it is approaching the Milky Way at 244 km/s. This is due to its falling towards the center of the Virgo cluster from the opposite side, which causes it to move in the direction of the Milky Way. Messier 86 is linked by several filaments of ionized gas to the severely disrupted spiral galaxy NGC 4438 and shows some gas and interstellar dust that may have been stripped, as well as the gas on those filaments, of it. It is suffering ram-pressure stripping as it moves at high speed through Virgo's intracluster medium, losing its interstellar medium as it moves through it leaving behind a very long trail of hot gas. In the TV show Andromeda, M86 is cited as being the origin of the Magog invasion of the three galaxies in the season 2 opener "The Widening Gyre"
^ a b c d e f g h i j "NASA/IPAC Extragalactic Database". 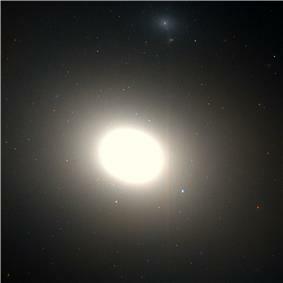 Results for NGC 4406. Retrieved 2006-11-14. ^ Jensen, Joseph B.; Tonry, John L.; Barris, Brian J.; Thompson, Rodger I.; et al. (2003). "Measuring Distances and Probing the Unresolved Stellar Populations of Galaxies Using Infrared Surface Brightness Fluctuations". ^ Jacoby, G. H.; Kenney, G. H.; Tal, J. D. P.; Crowl, H. H.; et al. (2005). "Imaging and Spectroscopy of Large Scale H-alpha Filaments in M86". ^ Gomez, H. L.; Baes, M.; Cortese, L.; Smith, M. W. L.; Boselli, A.; Ciesla, L.; et al. (2010). "A Spectacular Hα Complex in Virgo: Evidence for a Collision between M86 and NGC 4438 and Implications for the Collisional ISM Heating of Ellipticals". Astronomy and Astrophysics 518. ^ Randall, S.; Nulsen, P.; Forman, W. R.; Jones, C.; Machacek, M.; Murray, S. S.; et al. (2008). "Chandra's View of the Ram Pressure Stripped Galaxy M86". The Astrophysical Journal 518 (1): 208–223. ^ "Globular Cluster Systems in Galaxies Beyond the Local Grup.". 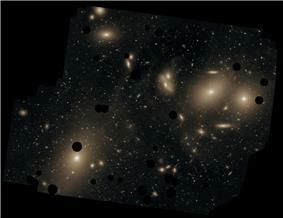 NASA-IPAC Extragalactic Database (NED). Retrieved 2012-07-21. ^ Janowiecki, Steven; Mihos, J. Christopher; Harding, Paul; Feldmeier, John J.; et al. (2010). "Diffuse Tidal Structures in the Halos of Virgo Ellipticals".